I’ve got a post up on Fusion collecting my sketches of scenes from the Democratic National Convention. Also be sure to check out this great collection of women cartoonists offering advice to Hillary Clinton, which I had the pleasure of editing. 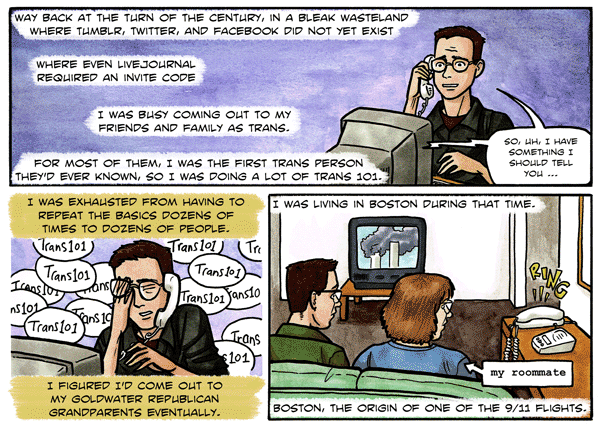 Here’s a comic I edited by the talented Dylan Edwards about coming out as trans in the era before social media (or many examples of trans people in pop culture). Entitled “How I told my grandma I’m transgender,” it shows why media representation is so important. Dylan was a pleasure to work with, and deserves more fame in the comics world. Today I can finally share a big project I’ve been working on for weeks: a comic account of my friend’s sexual assault in college. 33 years after the incident, she received a phone call from her assailant. If you haven’t checked out Graphic Culture, the comics section I edit for Fusion, please do. And follow us on Twitter and Facebook! I’ve drawn a follow-up to my earlier comic for Kaiser Health News about being a freelancer in search of decent health insurance. 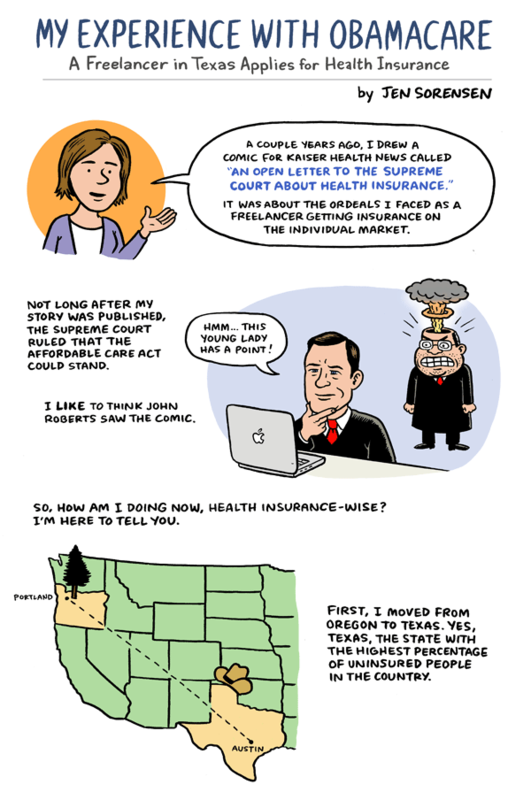 This one is about my experience getting covered through the Affodable Care Act. Read the rest on KHN. 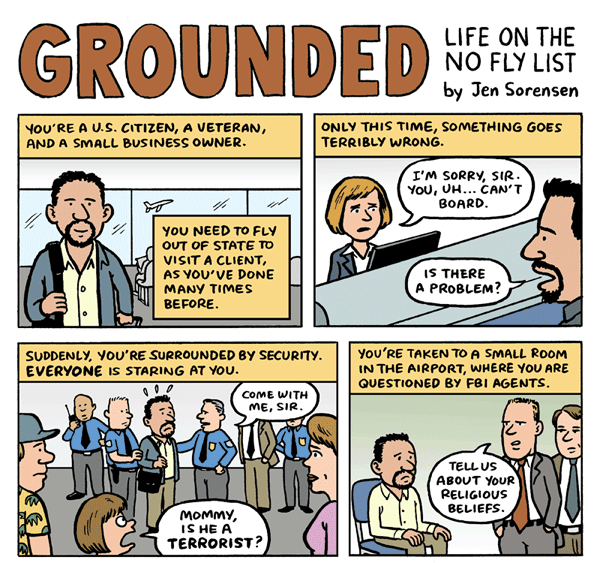 One of the projects I’ve been working on is an comic for the ACLU about innocent people trapped on the No Fly List. Working on this story (based on actual client testimony) was a real eye-opener. As things stand now, these people have alarmingly little recourse to clear their names. Oral arguments in the ACLU’s lawsuit Latif v. Holder took place this week in Portland, OR. Yesterday I received a phone call from our media team to tell me that the ACLU had targeted AUL. . . in a cartoon! I have to admit, I was taken aback. It’s a clear caricature of AUL’s President and CEO, Dr. Charmaine Yoest, mocking our efforts to defend women and unborn children. Of course, personal attacks against your AUL team are nothing new. We’ve had radical bloggers post our home addresses online; family members have received hand-written threat letters in mailboxes; and just last week someone infiltrated the post office and attempted to redirect our mail in an effort slow us down. At AUL, we know we will face personal risk, and we accept it knowing that saving lives and protecting women is well worth it. The more successful we are, the more virulent our opponents become. But, the ACLU’s attack is particularly concerning. No longer are we facing threats from radical lone-ranger pro-aborts, but bullying from the ACLU, a well-funded nationally-known organization of attorneys. 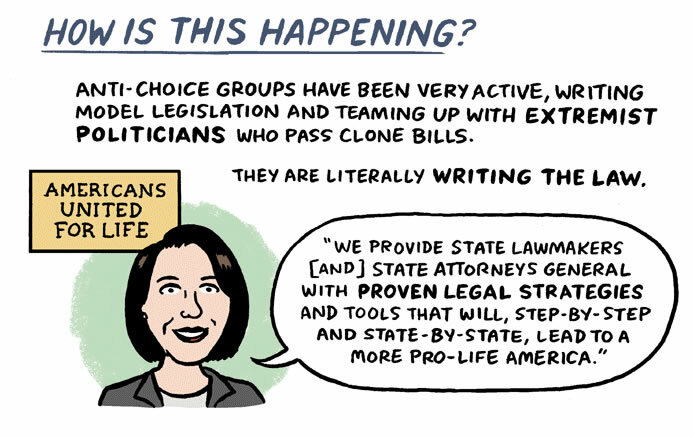 The ACLU even enlisted the help of well-known comic artist Jen Sorensen to create the cartoon. The ACLU has reached a new low in professionalism by childishly mocking the individuals who make up your AUL team merely because we are effective in advancing a cause we believe in. The sacrifice and dedication of our team to Life is no laughing matter. And this juvenile attack by the ACLU only serves to increase our dedication to continue fighting for Life. If you would like to show your AUL team special support in light of these events, any donation you can make today is appreciated. Thank you for standing with us as we face these attacks. “Radical lone-ranger pro-aborts”?! That’s one I haven’t heard before. I’m also pretty sure this is the first time I’ve ever been accused of bullying. If anything, I tried to draw Charmaine Yoest, AUL’s president, in a straightforward manner so as to present the group’s self-stated agenda as plainly as possible. I realize fundraising emails tend to be hyperbolic, and I don’t bear AUL any particular ill will. At least they referred to me as “a well-known comic artist.” But I do find it interesting that instead of responding to the points I actually made in the cartoon, they simply resort to pejoratives like “juvenile” and “childish.” Yoest also dismissed my “cartoonish images” in a statement to the Washington Times, which wrote an entire article about the comic. A political cartoonist drawing cartoonish images? Well, I never! Finally I get to share this very cool project I’ve been working on. 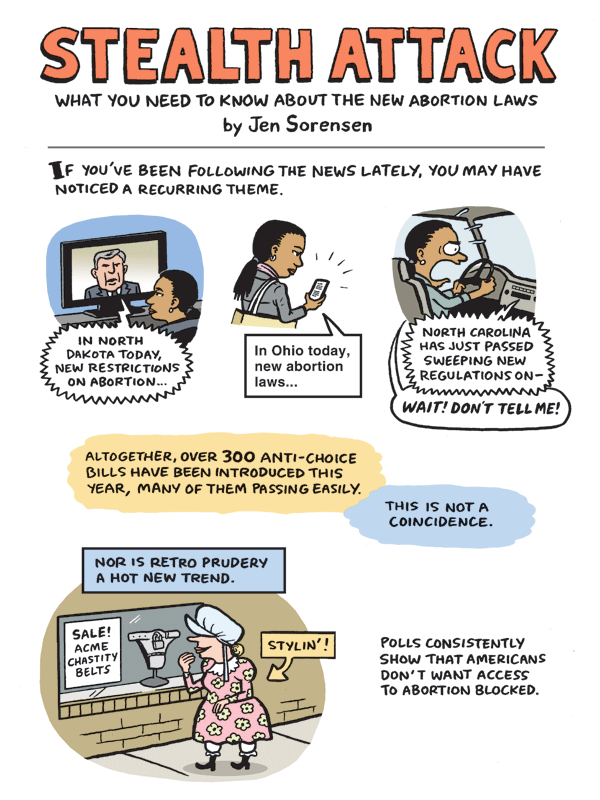 The ACLU commissioned a long-form comic from me about the rash of new abortion restrictions around the country. Click through for the full story. 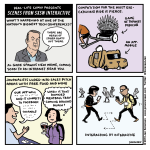 The comic also appears on Medium with a slightly different ending. 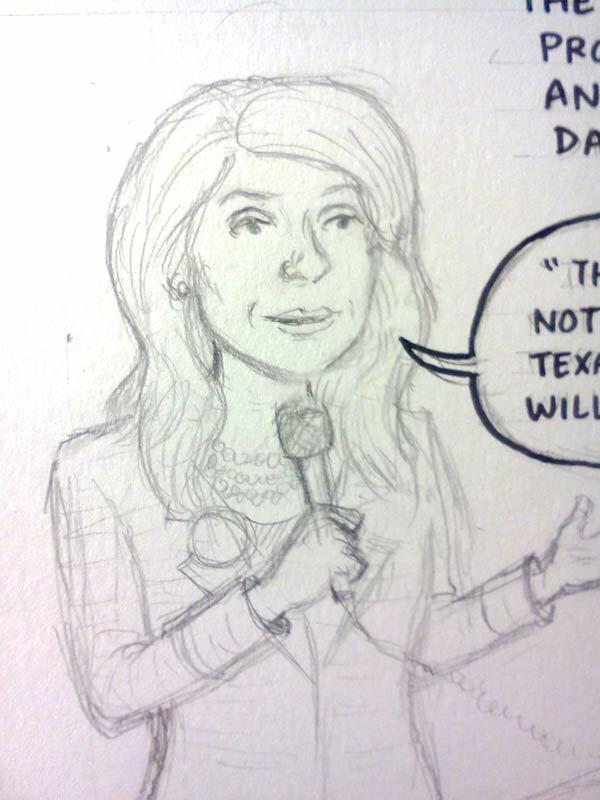 Is that Wendy Davis on my drawing table? Why, yes it is. 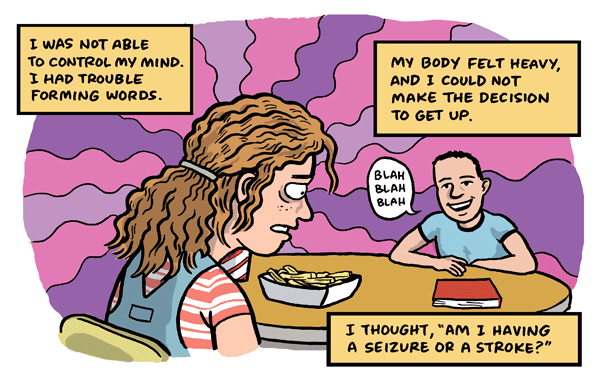 This is from a long-form comic I’m working on for a nonprofit, to be published next week. I’ve been meaning to share a one-page comic I drew recently for Vermont’s Seven Days altweekly, which publishes a cool annual cartoon issue full of stories rendered in comic format. I teamed up with News Editor Andy Bromage to create this piece about a local activist for undocumented farm workers, Danilo Lopez, whom you could justifiably call the Cesar Chavez of Vermont. Danilo was ordered to self-deport by July 6. Not long after the comic was published, U.S. Immigration and Customs Enforcement granted him a “stay of removal” that postpones his deportation for at least another year. 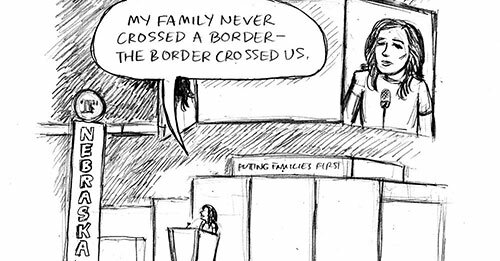 While I doubt that the comic affected the ICE’s decision, I’m right proud of it nonetheless. It’s probably a good thing that SXSW ended, or I’d never be productive again. A couple of these drawings were purloined from a series of illustrations I was doing for the Austin Chronicle. I maintained an informal “SX Sketchbook” for their blog. You can check out my coverage here (this page links to previous installments). I was particularly enamored with the trade show booth of an established HR company called TriNet. 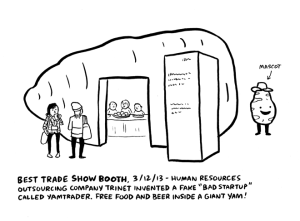 Realizing, perhaps, that their business is on the dry side, they invented a fake company called YamTrader, and set up a giant yam with food inside (albeit no yam dishes, if memory serves.) They had a yam mascot and everything. Note to self: next trade show, we are building a larger-than-life beet to catch editors’ attention. Ever wonder what Jane Austen’s “Pride and Prejudice” would look like as a one-page comic? For the novel’s 200th anniversary, NPR Books asked me to create such a thing. As a creator of complex female characters, of course, Austen was very much ahead of her time. Two hundred years ago, she was more highly advanced than most Hollywood screenwriters are today.